Me and Dad in the early 90’s during one of the few years he didn’t have a beard, when you can see even more clearly how much I look like him. Hi, My name is Caitlin Gilman and I’m a writer, waitress and theater artist in Seattle, WA. 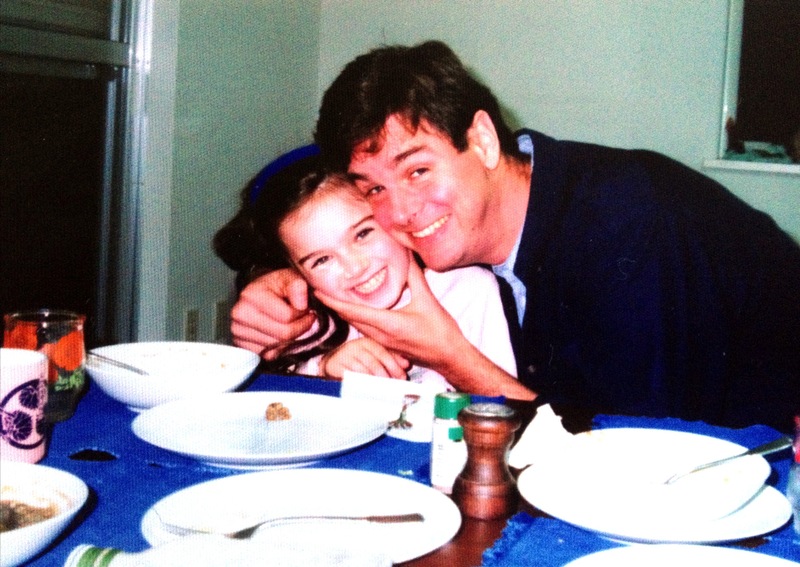 In late August of 2014, I lost my father, Chis Gilman, to brain cancer and I started this blog soon afterwards. Its a memoir of sorts, and a tribute to the incredible life he lead and the wonderful relationship I shared with him. Most of the blog can be read in any order, but if you’re just found me (welcome!) I invite you go back and read my first post The Language Legacy, where I talk about how this all began. The title of the blog is taken from a sub section of my dad’s (as of now unpublished) book. We were both introverts, and while I have no actual insight into how life works, I have lots of stories on how I have managed mine so far. I don’t know if you remember me but I taught creative drama at Edmonds Daigaku in Kobe because of your interest in drama. There was you and your sister, Sophia and Felicia as well as some of your Japanese friends in the class. I also remember that you wanted to be a writer…how wonderful that you followed through on your dream. We live in Vancouver and spend our winters in Mexico but hopefully we will be able to see you perform or attend one of your plays in Seattle some day. Caitlin, my name is Neil. Judy is my boss. Sorry to hear about your Dad. He was the one who hired me to teach at Edmonds after Judy and I had gone there to study Japanese in the summer of 1994. I found your site while doing some research on Japan for a novel that I’m writing. Really pleased to hear that you have an exciting career as a writer, actress and playwright.